UPDATE: ULTIMATE POKER HAS CLOSED ITS DOORS. Ultimate Poker first launched in the United States in Nevada and with the launch became the first to offer online poker services legally within the states. 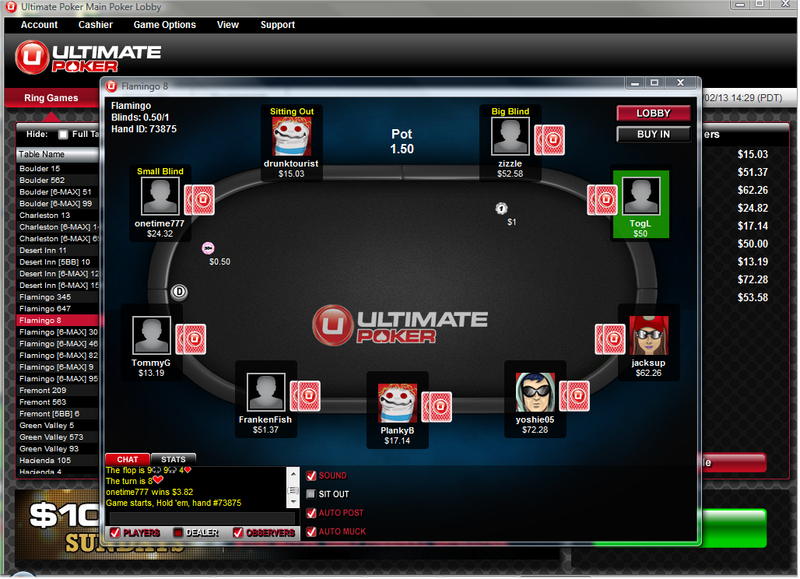 Ultimate Poker then branched out and launched a second site, this time in New Jersey. Ultimate Gaming, the parent company of Ultimate Poker and the Trump Taj Mahal, partnered to create the UCasino.com site to provide residents and visitors of New Jersey with additional online gaming options. Since launching in New Jersey, the Ultimate Poker site has been plagued with the same issues as other operators, such as geo-location verification problems and difficulty processing deposits. Players have had difficulty when trying to log on to the site with the geo-location service stating that players are located in another area. Financial providers such as credit card companies have also refused to allow deposits or withdrawals from such sites despite the fact that the states have legal license to run their software within their state’s borders. Despite the issues, players have still been able to enjoy the site, even though the traffic has somewhat stabilized since WSOP.com came along to rival them. The software was created by CyberArts and has a similar look as Full Tilt Poker has in the past. The software transitions smoothly during game play and there are two options to choose from: Downloadable and Flash. With Downloadable, you will have the full gaming opportunities and this option is available via OS only. The Flash client requires Java bug does not offer the full features of the site. Ultimate Poker does not currently offer a mobile client. Ultimate Poker is not the #1 choice for online poker play in the state of New Jersey so the player numbers are not as solid or as large as such sites as WSOP or Party Poker. The 24 hour peak (according to PokerScout) is around 25 with only 6 players on a 7 day average in real money ring game play. With Pot Limit and No Limit, players will be able to wager $0.01/$0.02 to $3/$6 and limit games have stakes of $0.10/$0.20 to $10/$20. The poker site also offers tournament options with sit& go and multi table gaming. Buy-ins start at $1 and can go as high as $50. New members of Ultimate NJ will be able to earn a first time deposit bonus of 100% worth up to $500. This bonus does not expire and requires a $50 minimum deposit. Players will also receive the bonus in $50 increments. It is one of the easier bonuses to clear in online poker in general, as well as being one of the simpler bonuses currently being offered by legal poker sites in the USA. Ultimate Poker does have promotions available from guaranteed tournaments to special events. By checking the promotions tab at the online poker site, players can stay informed of the latest offerings. Each month, the site has new options for players to be able to pad their bankroll. Color UP is the name of Ultimate Poker’s VIP Rewards Program. With this tiered program, players earn rewards based on the VIP level earned. There are 8 separate monthly tiers and 2 yearly tiers available. Players will earn U-Points which can be converted and reach milestone cash bonuses. The program has two points systems: Experience and U-Points. Experience points determine the VIP tier while the U-Points are used for prizes and cash. 10 XPs are given for each $1 in rake contributions.